I'm going to review an album! It's been, what, eight years since I've done a full-length article album review? What's taken so long to do another? Well, kids, papa's been busy. If you notice, I've gone from doing dozens of articles a year to sometimes just a couple (though I managed to squeeze 7 into 2011. Is there a 7/11 joke in there somewhere?). But I'm back now, and I've decided to do something a bit different with this review: I'm going to liveblog the album. I guess liveblog might not be the right term, but I'm going to listen to the album once all the way through and type my thoughts about it as I go, then give some summation at the end. Sound good? TOUGH. 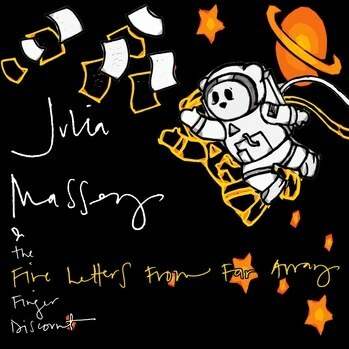 The album I've chosen is Julia Massey & The Five Finger Discount's third album, Five Letters From Far Away. Shal we begin? Let's. The album starts out with an incredibly energetic burst of piano, which is quickly followed by a fascinating vocal effect that has an echo that isn't quite an echo. Soon the drums and bass fall in, both very driving, moving forward like a train. This is a great opening to an album; it has all the energy of a fast-paced Ben Folds song, but occasionally takes breaks and opens up, like looking out the window of a speeding train towards the horizon, until finally the song builds and builds and builds before an abrupt end. It's a good rockin' song that doesn't overstay its welcome. An almost-entirely-instrumental song, with a happy synthesizer and slappy bass. It's good fun to listen to, light and poppy. The bass changes towards the middle of it (right before vocals come in) to sound almost like an electric cello and impart some spaciness into the song that the heavily-reverbed vocals continue. It's oddly placed in the album, though, having that much of an instrumental in the 2nd position. After the high, poppy fun of the first two songs, Sri Ma cools things right down with a very deliberate, rhythmic, simple melody and keyboard arrangement. The drums and bass build in the background, but the keys and repeated lyrics (this song seriously only has 4 lines of lyrics) are consistent. It's very hypnotic, but doesn't quite achieve the emotional power of the similar Catacombs from I'm Not Hollow. The brief, distorted bass solo at the end is pretty awexome, though, and it's interesting to note just how energetic the song has become at the end compared to how it began. Continuing in the same vein as Sri Ma, Marquee Malarkey starts with a simple, repeated keyboard part over which the vocals, bass, and drums slowly build. The melody is much more complex, and weaves all over the simple keyboard part with great variety. It is the most relaxed song on the album so far, until the bridge, when the song kind of blooms upwards, reaching out and unfolding for a moment before building into a more full, energetic sound. This develops for a little while before falling off again into the simple, relaxed song with which we began. It ends with a very ominous, isolated word: "Down." Here we go! This song starts right out (after a brief, rhythm-setting drum section) with a driving, uptempo almost-blues-but-not-quite piano part. Gah, I love this song! Like Catacombs before it, it pushes all of my musical buttons. And the way Julia leaves off the implied "neighbor" in the last line before the solo begins gets me every time. And what a great bass solo! Not too flashy, but it hits just the right notes. It's up there with Ryan Roullard's masterpiece bass solo from The Wastelanders' Go Down Mother. This song is epic. It keeps going, keeps evolving, with extended solos from all the musicians that all riff around the central theme like a great jazz song. It finally seems only to end because it has exhausted itself and needs to go backstage and wipe its face with a towel. This song is by leaps and bounds my favorite on this album. But the album isn't over! We go right into a keyboard-and-drums driven song with Backdoor Open, that calls back to Sri Ma with its simple, basically lyrics-free chorus (to be fair the chorus in Backdoor Open is a different word that is really drawn out each time). The bridge again opens up to a nice spacey vista before coming back to the song. This one reminds me a lot of Yeah! from their previous album. It also does something that I rather like: a song from each album quotes a song from a previous album. Backdoor Open quotes (rather extensively) Is There Room From Me from the eponymous 2nd album. And on that album Skatepark quotes Fruit Tree from the 1st album. It's a nice way to tie all the albums together. This is actually a remake of a song from a pre-FFD album. But what a remake! It is Geoff's big, shining moment on the album, in that the bass is the only instrument. And it is frikkin' gorgeous. It is haunting and full and brilliant. This is also the spaciest of all the songs on the album up to this point. It also does that really cool echo-that-isn't-quite-an-echo trick. Eventually the drums and later keyboard join in for a new, extended ending that wasn't in the original version of the song, "Pitter-patter, raindrops fall on me." This is the most lush and gorgeous song on the album. This song is an interesting fellow, in that it's actually two songs in one! On one hand we have a catchy, tight, organ-driven song with a simple, three-beat backing. But then it opens wide and becomes extremely spacey, and keeps flirting back and forth between the two styles. It also teases a line from Swing Low, Sweet Chariot before finally fully embracing the spaciness and becoming a cover of that song for most of its final third. It's pretty epic. Here is a great, 6/4 jazzy song, with its tripping piano, it's swinging drums and earnest vocals. But it also retains the signature JM+FFD spaciness in it, especially in the openness of the "Hold on" section right before the end, when some charming sleigh bells come in! It's a wonderful little gem of a song at only 3:00 even. Yes, OUTRO in all-caps. If you thought some of the JM+FFD songs flirted with spaciness, this song decadently wallows in it like a pig in mud... in a good way, I mean! This is a heady, echoey, downtempo wall-of-sound. It has hints of nostalgia and seems introspective even while it's way out in space, in a "look at how far we've come" kind of way. You'd think a song called OUTRO would be the final song on the album, yeah? WRONG! We have the actual ending here, in a simple, earnest, beautiful song that is just Julia and her guitar (the only song where she plays the guitar on the entire album). It is the kind of wistful. If OUTRO had hints of nostalgia, this song is drenched in it, sad and triumphant at the same time. It's like turning the lights out in a child's room as they fall asleep. Finally, hidden at the end of the album is a reprise of the Swing Low, Sweet Chariot from Who Silently Suffers, but without the instruments and with some fascinatingly-complicated vocal harmonies. It's interesting that the songs on this album can almost be divided into three distinct camps. For one you have the piano-driven songs that flirt with jazz and blues and Ben Folds: Top 100, Dont Worry 'Bout Us, and There Is a Song. Then you have the Keyboard-driven songs with simple, repeated choruses and lively musical melodies: Sri Ma, Backdoor Open, and Marquee Malarkey with some Who Silently Suffers in there. And then you have the variety songs, like Orbiter, Song of the Dying, OUTRO, and Here Is a Stone Wall, each of which has a central gimmick that sets it apart from the other songs in the album: almost-entirely-instrumental, bass-only, extreme-spaciness, and guitar-only respectively. This is my favorite JM+FFD album so far, narrowly edging out Is There Room For Me due to slightly higher production values. This album just feels more lush and full and the mixing and mastering is masterful. My only quibble with it is the album order. Some of the songs seem oddly placed, and sometimes song that are too similar to each other and too close together. But that might be a symptom of something else going on in this album that I find fascinating: It keeps trying to end. Like the Return of the King movie, so many of the songs in Five Letters From Far Away sound like they're meant to be the final song in an album. It's almost impossible to recover from the epicness of Don't Worry 'Bout Us. There Is a Song ends so satisfyingly that it's almost a surprise that there is more to come afterwards. Who Silently Suffers brings the full weight of Swing Low, Sweet Chariot descending into the album to end it on a massive note. And OUTRO is called OUTRO, for Christmas sake! Any of those songs are songs that you'd play at the end of your set to let the audience know without telling them that, yes, this is our last song. I'm not saying this in a bad way, though! I just find it fascinating that so many of songs that were written during this part of the FFD's career had such finality built in. And there you have it. A liveblog (or whatever) and some final thoughts. This is an excellent album, and here are links to where you can come get some if you don't already have it.